There was an old whaling song that started “it’s a damn tough life full of toil and strife/ We whalermen undergo.” Sailors in the early US Navy didn’t have it much easier. Sure, there were more hands to do heavy lifting, and the voyages typically lasted only a few months, if that, before a warship dropped anchor in a secure port. And yet, daily existence on a warship was perhaps even more perilous than on a whaler or merchantman. Just sailing a frigate, with its towering rig and enormous spread of sail, required an active crew. Racing aloft at the word of command from the quarterdeck was not for the faint of heart. Miraculously, only four of Constitution’s sailor fell while working in the rig during the War of 1812, but for nearly all of them it ended badly. Hitting the deck meant almost certain death. Hitting the water meant almost certain drowning. Nothing is soft when you land on it from a height of two hundred feet. Hold on! Working high in the rig could be dangerous, especially in strong winds or heavy seas. 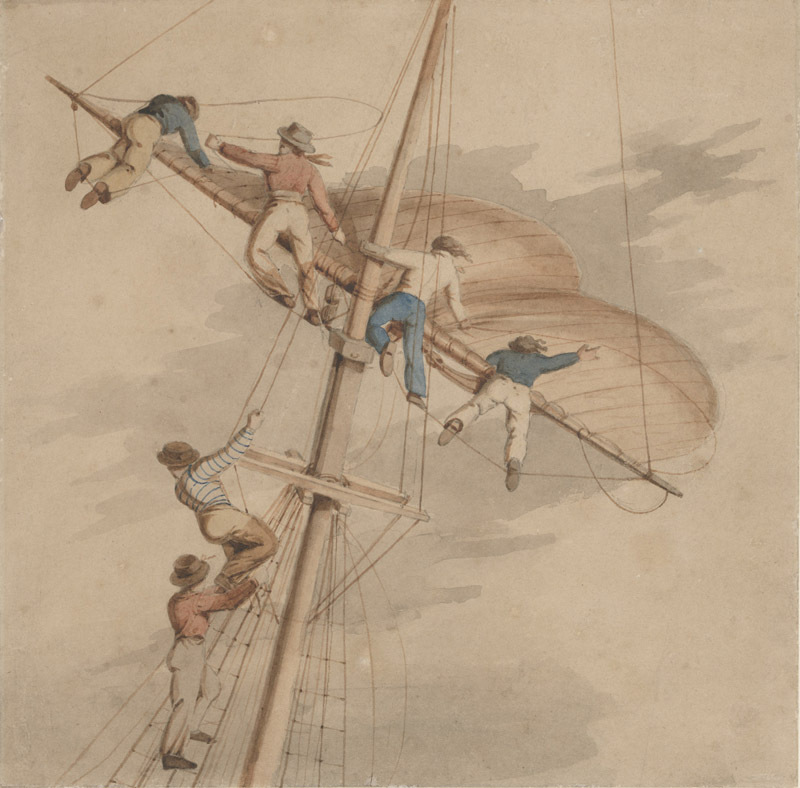 The seamen in this 1830s watercolor struggle to furl an unruly sail. USS Constitution Museum collection. Had his arm caught with the anchor this morning & had the anterior part of the wrist much cut & lacerated exposing & injuring some of the flexor muscles of the fingers. Brot [sic] the skin in contact & confined it by 2 stiches [sic] then applied pledgets of lint wet with Laud[anum] & a bandage over all. applied a Splint behind the arm & back of the arm hand to steady the hand & Keep the fingers straight. Keep the arm confined to the breast by a suspending bandage. On wooden ships, splinters struck off by enemy shot caused huge numbers of casualties among the crews. During Constitution’s battle with HMS Cyane and HMS Levant in February 1815, a number of “Old Ironsides,” crew received debilitating splinter wounds. Vincent Marks caught one the left knee while serving the number three gun on the gundeck. David Quill, captain of the same gun, “received a severe splinter wound upon the elbow the effects of which still remain in interrupting the free motions of the joint.” Elsewhere, a splinter hit Andrew Chalmers’ left hand.